How to calculate the azimuth from latitude and longitude? 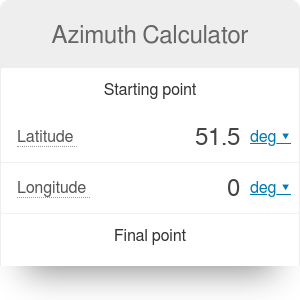 This azimuth calculator will let you calculate the azimuth from latitude and longitude. It will tell you what is the direction you need to point your compass to, and what is the shortest distance between two points of known geographical coordinates. This article includes a short explanation of the formulas we used - they can prove themselves helpful if you plan to find the azimuth by hand. This is not a spherical coordinates calculator - it deals with geographical coordinates only! By the US Army definition, the term azimuth describes the angle created by two lines: one joining your current position and the North Pole, and the one joining your current position and the distant location. Azimuth is always measured clockwise. For example, a point lying east from you would have an azimuth of 90°, but a point lying west from you - of 270°. If you want to give a location of a point relative to your current position, you need to provide two values: the azimuth and the distance. If Earth was flat, the latter would simply by the straight-line distance between two points. As Earth is a sphere (or, to be more precise, a geoid), it is the shortest travel distance between the two points ('as-the-crow-flies'). R is the radius of the Earth, expressed in meters (R = 6371 km). Determine the longitude and latitude of London - our initial point. We can find that φ₁ = 51.50° (positive, because it lies in the northern hemisphere) and λ₁ = 0°. Determine the longitude and latitude of Rio de Janeiro - our final point. We can find that φ₂ = -22.97° (negative, because it lies in the southern hemisphere) and λ₂ = -43.18° (also negative, because it lies in the western hemisphere). Calculate Δφ = φ₂ - φ₁ = -22.97° - 51.50° = -74.47°. Calculate Δλ = λ₂ - λ₁ = -43.18° - 0 ° = -43.18°. Congratulations! You have just calculated azimuth from latitude and longitude. Azimuth Calculator can be embedded on your website to enrich the content you wrote and make it easier for your visitors to understand your message.